Welcome to Stam’s Gourmet Food. 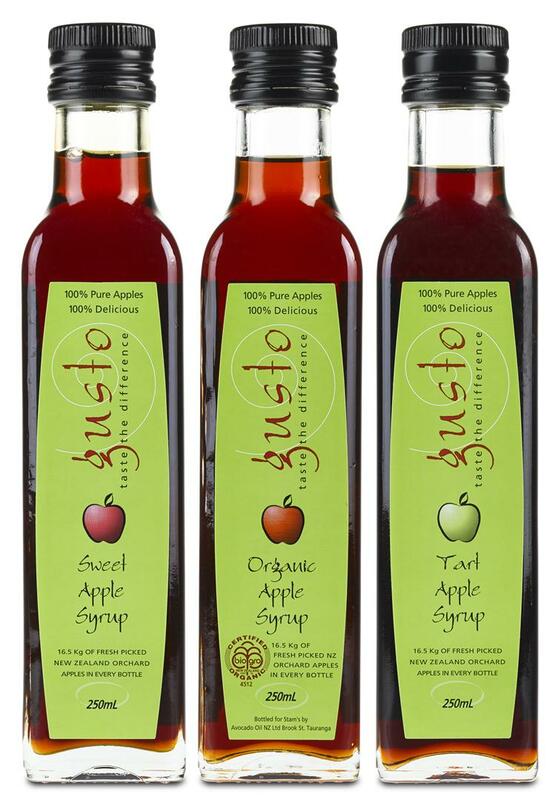 Gusto Apple Syrup is made from 100% pure natural orchard apple juice, gently heated to concentrate the flavours and form a rich delicious syrup. There is nothing added, no preservatives, no sugar, no flavour – just the juice of kilos of apples concentrated into every 250mL bottle. Enjoy our pure Apple Syrup on ice cream and desserts, glazing a ham, and over pancakes and bacon. Try it as a natural alternative to sugar on yogurt and muesli. Gusto Apple Syrups are available in all good food outlets, delicatessens, and supermarkets throughout New Zealand.